Vince Keenan: Noir City: Portland Exposé! Anytime Noir City adds a burg to its burgeoning family of festivals, it’s cause for celebration. Rosemarie and I made a weekend jaunt to the Rose City for the debut installment of Noir City Portland at the Hollywood Theater. Alas, the film that gave this post its title wasn’t on the bill. Content yourselves with the trailer. We weren’t able to make opening night, so we missed seeing the too-long-unheralded Sleep, My Love (1948) on the big screen. We were on hand to revisit a few other favorites, though. A repeat performance of Repeat Performance (1947) underscored how well-crafted this haunting melodrama is. Joan Leslie is an actress who kills her husband on December 31 only to discover once the clock strikes midnight that the old year has begun anew, giving her a chance to change her destiny – and her spouse’s. And any opportunity to watch Alias Nick Beal (1949) must be taken advantage of. This noir retelling of Faust is nothing short of spellbinding, with magnificent atmospherics, Ray Milland’s devil sounding more lobbyist than Lucifer, and a spectacular performance from Audrey Totter. The film remains the crowning accomplishment of director John Farrow’s career. Farrow deserves a book, but so far there’s only the overview of his career in Noir City Annual #2, written by – hey, me! The film that was new to us was 1956’s The Come-On. You’ve got your classic triangle: gorgeous dame, yearning lover, rich older husband. Only you don’t actually have any of that, because the movie has a few tricks up its sleeve that I don’t want to spoil. Film Noir Foundation impresario and master of ceremonies Eddie Muller introduced the movie as a rare example of “cougar noir” given the casting choices. Anne Baxter, aging out of ingénue roles, plays the dewy damsel in distress with a core of steel. 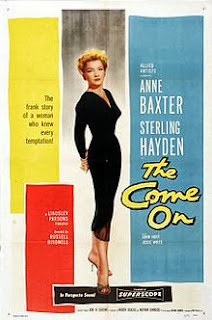 Opposite her is Sterling Hayden, reading every line like a man who left a truck of livestock double-parked in the sun. Even though Hayden was older, their peculiar dynamic makes him seem like the junior partner in the relationship. The high point of the film is Maytag repairman Jesse White as a sleazy private eye blessed with the perfect handle J. J. McGonigle. Both competent and greedy, McGonigle is one of noir’s indispensible shamuses. Trashy fun from start to finish. Strong attendance and a terrific venue. Here’s to next year’s version. Portland has a thriving cocktail scene which we were also more than happy to investigate. We made multiple stops at Clyde Common, not only for its food but the drinks program overseen by the estimable Jeffrey Morgenthaler. Their brunch cocktail the Bridge Club – Canadian club whiskey, brown sugar, black walnut liqueur, allspice dram, coffee and thickened cream – instantly entered my personal pantheon. Owing to the short length of our trip we only managed one drink each at Teardrop Lounge and Oven & Shaker. Each warrants another visit.